In high school, our cafeteria had an amazing selection of snacks and candy. If I had an extra .50 cents I use to love picking myself out a treat to save for before swim practice after school. 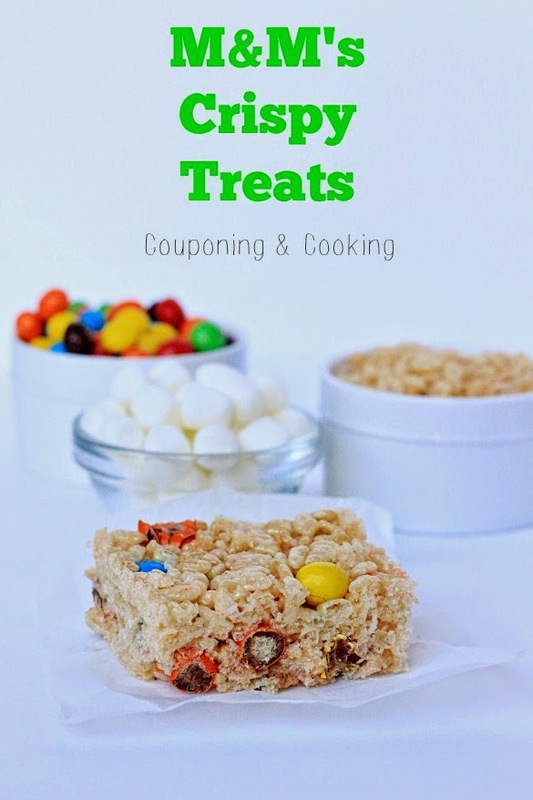 One of my favorite things to get were M&M's® Crispy. Back then they came in a bright blue bag and I loved how crunchy and airy they were. I was devastated when they were discontinued so you can imagine my excitement when I walked into CVS last week and saw that they had been brought back in all their crispy glory. I'm now a teacher at my former high school and I cannot tell you how happy it makes me to see our cafeteria carrying M&M's® Crispy once again in their new, light green bag. The delicious milk chocolate with a crispy rice center with only 180 calories per serving still makes for perfect afternoon snack (teachers need snacks too). While I love the single serving bags, I am thrilled that they now come in larger sized bags too so that I can easily use them for baking at home. 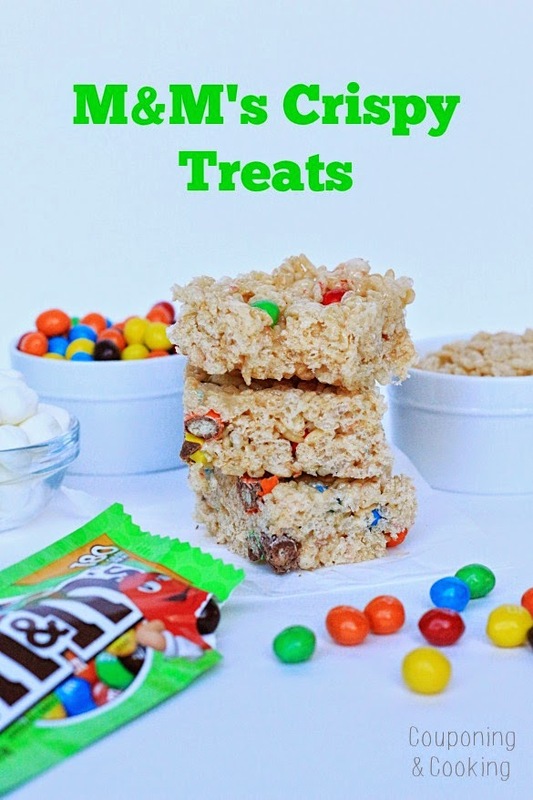 Since M&M's® Crispy bring back all kinds of nostalgia for me it would make sense that I should use them one the most nostalgic childhood desserts- Rice Crispy Treats. 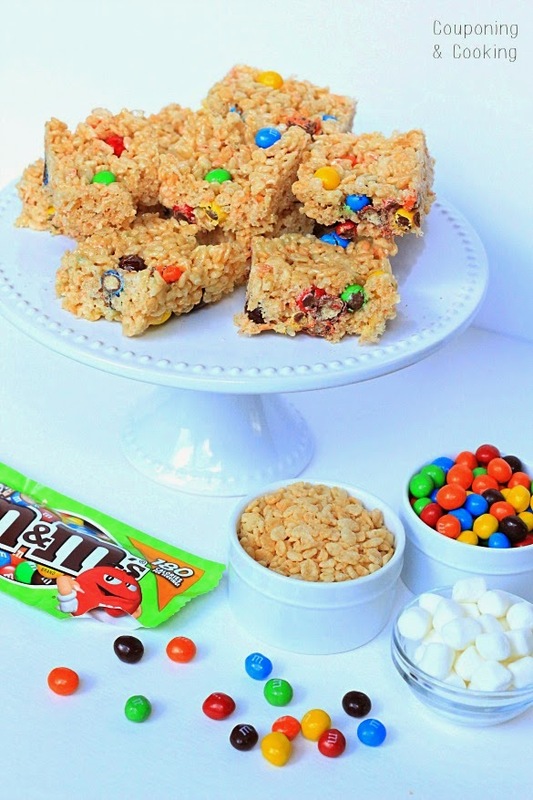 These are just your standard rice cereal treats adjusted to make room for lots of colorful, crunchy M&M's®. 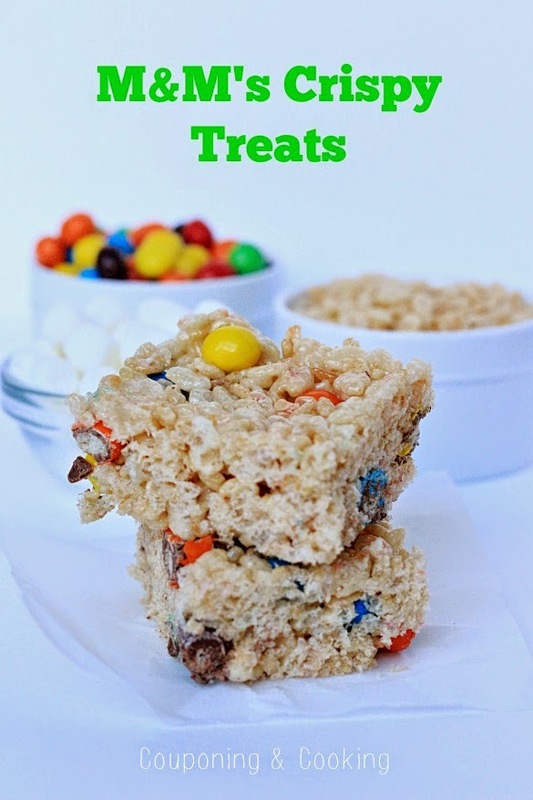 As if these treats weren't crispy enough, the addition M&M's® take them over the top with their chocolate and crispy centers. These take only minutes to make and I for one would be happy to find one in my lunch bag or waiting for me at home when I got back from school. (hint, hint husband) You can add more or less M&M's® Crispy depending on your tastes but I found a cup to be the perfect amount. 1.) Place the marshmallows and butter in a large microwave safe bowl. Microwave for 2 minutes and then remove and quickly stir. Microwave for another minute and stir again. 2.) Slowly combine rice cereal into marshmallow mixtures. 3.) 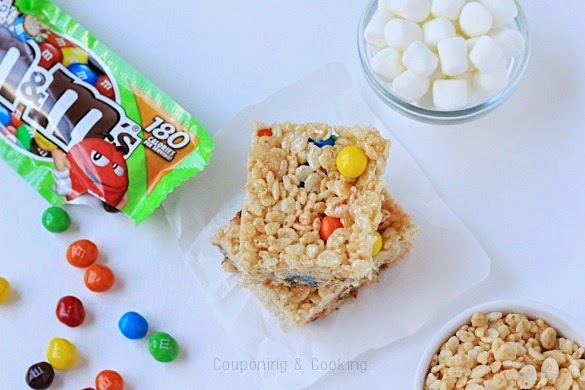 Once combined stir in the M&M's® Crispy. Don't stir them too much or the colors of the shells will start to run. 4.) Using a spatula lightly sprayed in cooking spray, press the mixture into a lightly greased 9x13 pan. 5.) Let cool completely and then cut and serve. They can be individually wrapped in plastic wrap for an on the go treat or stored together in an air tight container. 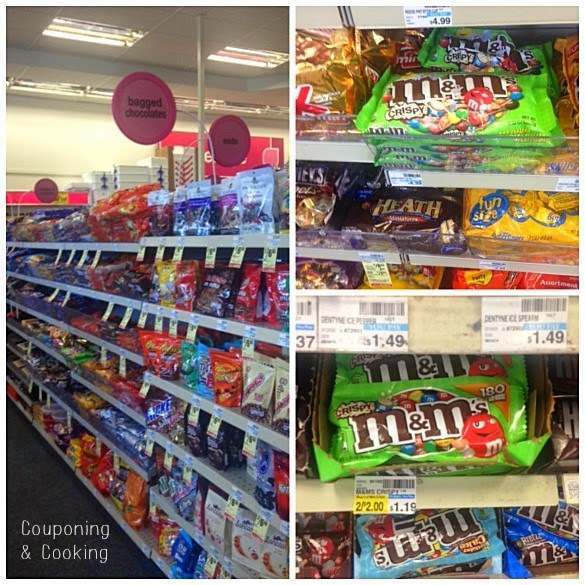 Right now you can save $1 when you purchase M&M's® Crispy at CVS. Be sure to print out this coupon and save!